Weight: 1 kg (approx.) vacuum pack. Ingredients: Pork meat, salt, pepper. Preservatives E250, E252. 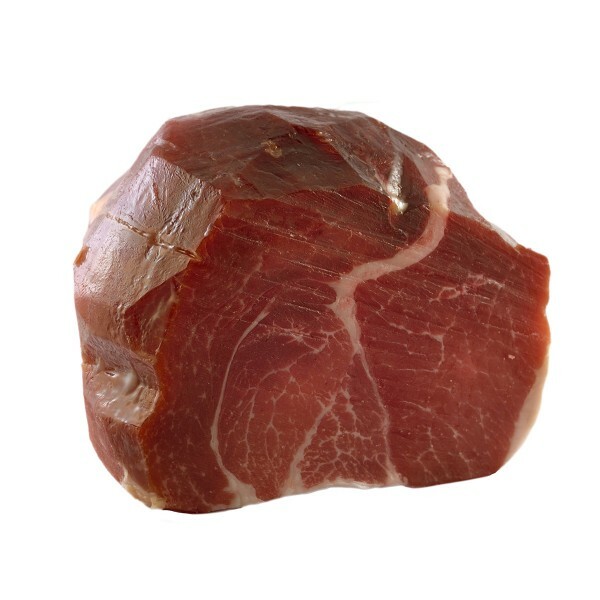 Description: The “Fiocco” is the smallest and muscular section of the back of the swine thigh. Workmanship is identical to that of Culatello. After trimming the thigh, proceed with the trimming to give the Fiocco its characteristic round shape. Subsequently the meat is salted and stuffed into the bladder of the pig, then articulated with a natural string. Once washed and dried, it is ready for seasoning. Compared to Culatello, the Fiocco is a lighter sausage, which requires a lower seasoning: if at least ten months are needed for Culatello, seven or eight will be enough for the Fiocco. When cut into thin slices, the meat has a ruby red color with minimal fat content. The scent is characteristic of Culatello, intense at the right point, with hints of moss and roses.